You take one look at the title of this dish and you say, “HOW much garlic?! Hey, I just met you and This is crazy!” It sounds intimidating. It sounds strange. But just bear with me, and I promise you will NOT be disappointed. One of the very first things I ever saw on the Food Network was the episode of Barefoot Contessa where Ina Garten made Chicken with Forty Cloves of Garlic. It was the episode that first made me crave owning a dutch oven (a mission that was quite recently accomplished, thanks to my generous boyfriend) and the first recipe that made me actually WANT to cook with alcohol. I know that forty cloves sounds like a lot of garlic. I mean, it is. But in reality, I think this was really more like 32 cloves, and either way, it’s the least garlicky-tasting garlic dish you’ll ever taste. It’s not spicy, it’s not overpowering, it’s just… delicious. Like, I-want-to-eat-the-leftovers-for-breakfast delicious. I did make a few adjustments to Ms. Garten’s original recipe, of course. First of all, her recipe called for cognac. What kind of twenty-something just happens to have cognac laying around? Pass. Secondly, I absconded with the heavy cream that her recipe calls for, and thickened the sauce with just a little bit of flour near the end. Thirdly, I added onion where there was none, so that I can at least pretend there’s some sort of vegetable nutrition involved here. And lastly, her recipe calls for utilizing an entire, skin-on chicken, which I was not willing to butcher for the sake of this dish. So I went with a package of boneless, skinless chicken thighs instead! No bones to eat around, nixing the skin also meant sparing myself a few more measly calories, and it was just so, so, so much easier. You could try making this recipe with chicken breast if you wanted to cut down on the fat even more, but I highly doubt it would turn out quite as good. Chicken breast just doesn’t hold up well under low-and-slow cooking, you know? I served it up over rice last night, with green beans and corn on the cob as the sides. It would be great over any grain of your choice — rice, barley, quinoa — or with a side of pasta! Of course, it’s definitely substantial (and delicious!) enough to stand alone, too. Maybe just add a nice toasted piece of bread on the side to mop up all the leftover sauce? Mmmm. Don’t be taken aback by the name: this succulent, savory dish is not as garlicky as you might think! 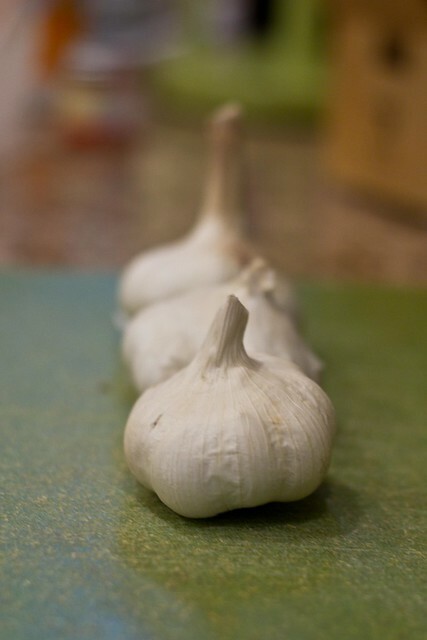 By allowing the garlic to cook low and slow, it becomes soft, sweet, and tastes simply heavenly. Enjoy over rice, noodles, or on its own! 1. Heat butter and oil in a large dutch oven or large pot to medium-high heat. 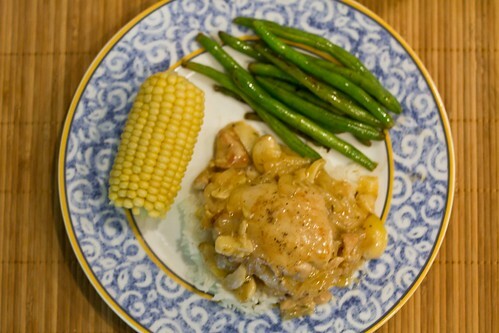 Season chicken thighs with salt and pepper, then sear in the pot for 3 – 4 minutes, allowing it to brown on both sides. Remove chicken and put it on a plate. 2. Reduce heat to medium and add whole garlic cloves and sliced onion. Season with salt, pepper, and thyme and cook until garlic has begun to get soft and onions are beginning to turn translucent, about 5 – 7 minutes. Add white wine and deglaze the pot, making sure to scrape up all the brown bits on the bottom of the pan. 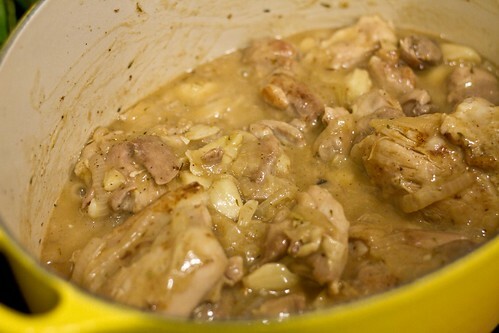 Add the chicken back into the pot, reduce heat to low-medium, and cover with lid. Cook for additional 18 to 20 minutes. 3. Remove the lid from the pot and spoon out about a quarter-cup of the liquid into a separate bowl. Add the tablespoon of flour and whisk together, then add back into the pot and mix. This will thicken up the liquid into a delicious sauce. Serve and enjoy! 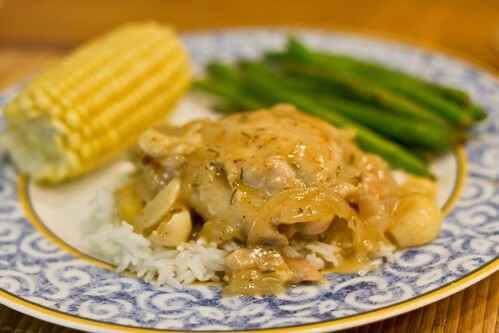 Nutritional info per 1/6th serving (1 chicken thigh + sauce): 199 calories, 8.9g fat, 8.4g carbs, 15g protein. I want to make this. I’ve heard SO MANY GOOD THINGS about it! This sounds absolutely fantastic! Wow, oh wow! Definitely need to try this! YUM! 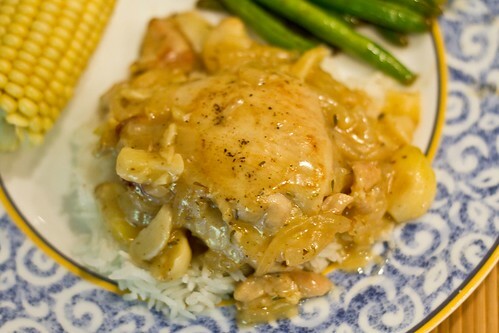 I love garlic and I am currently obsessed with chicken thighs, so this sounds amazing. They’re so easy to cook and just taste so much better than chicken breast to me. I was getting bored with my dinners and thought I’d change it up. I’m being bad though and making them with the skin and bone. It’s just too good! Last week, I made a recipe from this month’s everyday food… sticky orange glazed chicken thighs. A+! I’ve made this dish before, only my recipe is a little different. At the end it said to remove the chicken from the pot, mash up the garlic cloves, add the cream (milk or half & half) and reduce by about 1/2. 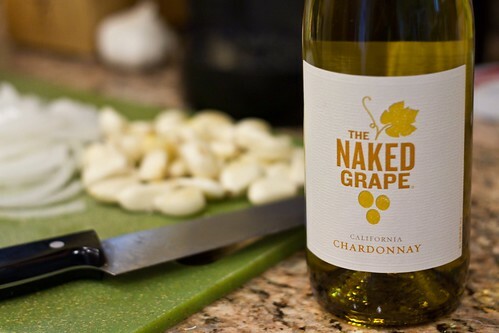 It makes a mashed garlic cream sauce that is some good! And you’re right, the garlic is not overpowering! This looks AMAZING! I LOVE how many garlic cloves there are! I made something similar that has paprika in it (I call it paprika chicken. Inventive, I know), but it doesn’t look as good as this! Love your recipes Gretchen! Also I laughed out loud at your call me maybe reference! 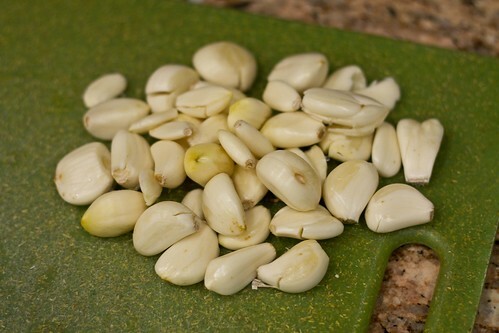 40 cloves of garlic sounds like the perfect amount! I love garlic and often have to dial it back when I cook for others 🙂 Have you ever roasted garlic? Absolutely. It’s the most delicious thing to spread on bread!! Dang, girl. Now I want a dutch oven to try this in. Love your blog – fitness and food! I will add this to my list of things to make soon. Hopefully I can use a crock pot. Keep up with the great work-outs, posts, and pictures. Thanks for sharing. This looks amazing! Ina is my all-time favorite Chef. She IS my american idol. I made this a while ago and we loved it! It was perfect for a dinner party that I threw. I used a whole chicken though for looks at the party. It came out awesome. I made this last weekend…holy cow…so good!!! Definitely a recipe I will make again. Thanks Gretchen!!! This sounds sooooo good!!!!! You know have me craving it lol. Maybe it’ll have to be one of the first dishes I make in our new Dutch oven :)! I made this tonight (from your recipe) and my friends and I loved it! We made it with chicken breasts (because that’s what we had) and it turned out great 🙂 We added a little extra of everything since 7 of us were eating. It was: Thumbs up, Fan-freaking-tastic, it made me full and that never happens, yummy and had the perfect amount of garlic. Those are all descriptions from my various friends 🙂 THANKS! Yay! That’s so awesome to hear: I’m glad it turned out well with chicken breast too, because that’s obviously an even healthier swap. I’ll have to try it with that next time myself! !